Are layer files compatible between ArcGIS 10 and 9.3? If I save layer files in ArcGIS 10, can they be opened and modified in ArcGIS 9.3? Then use the Save as type drop down list to select different versions of layer file. ESRI products is not backward compatible, as a workaround save as the layer file at version 9.3.1 to open and edit the layer flie at 9.3.1. Not the answer you're looking for? Browse other questions tagged arcgis-desktop arcgis-10.0 arcgis-9.3 layer-file or ask your own question. 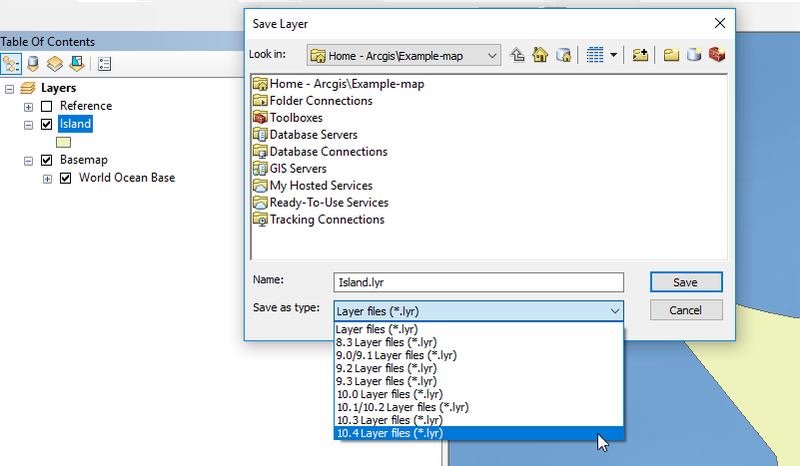 Are ArcGIS 9.3 layer files compatible with ArcGIS 10.1? Converting ArcGIS 10 styles to version 9.3? Downgrading from ArcGIS 10 to 9.3? Remove username and password from saved arcgis layer (.lyr) files? Using rasters/features created at 10.0 in ArcGIS Desktop 9.3? Removing and uninstalling previous version of ArcGIS Desktop? Iterating files in ModelBuilder of ArcGIS Desktop 9.3? Publishing maps and services to ArcGIS Server 9.3 when created by ArcGIS Desktop 10.0?